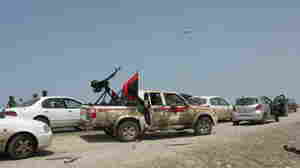 March 28, 2011  Libyan rebels pushed their way west along the Mediterranean coast Monday. 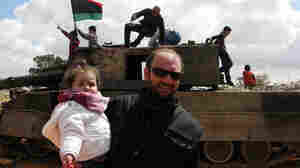 Helped by western air strikes, anti-government troops approached leader Moammar Gadhafi's hometown of Sirte. Roughly 60 miles away, there were sporadic clashes in a coastal valley. Also Monday, a few civilians began warily returning to their homes near the front lines. March 26, 2011  Rebel forces have re-established control over the eastern Libyan city of Ajdabiya following a night of NATO airstrikes. March 25, 2011  In the skies over Libya, NATO will take command of the no-fly zone. U.S. air and sea power will remain a key factor in keeping Moammar Gadhafi's troops from attacking. 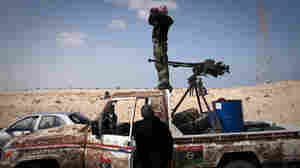 But on the ground, Libyan rebels are stalled in their efforts to advance on government forces. And civilians are fleeing the front lines of the fighting. March 24, 2011  Although anti-government rebels have been unable to dislodge Gadhafi's forces in key cities despite help from the Western coalition, the rebels' provisional body is moving ahead with efforts to build a political structure. But there's creeping fear that Gadhafi loyalists are trying to undermine those efforts. March 22, 2011  Coalition airstrikes have pushed forces loyal to Libyan leader Moammar Gadhafi away from the rebel stronghold of Benghazi. But the opposition has been unable, so far, to make much progress at all. They keep getting pushed back when they try to fight forward into the town of Ajdabiya. March 17, 2011  Libya's defense minister threatened that any Western airstrikes would endanger air and sea traffic in the Mediterranean. And it's not clear that grounding Moammar Gadhafi's air force, if that happens, will halt his ground advances, which have been backed mostly by his tanks, rockets and artillery. The U.N. is set to vote Thursday evening. March 16, 2011  Rebels battling forces loyal to Libyan leader Moammar Gadhafi appear to have lost control of part of Ajdabiya, the last city on the way to the rebel headquarters of Benghazi. The fading chances for the rebels — and dying hope that Western nations will intervene — have prompted Libyans to flee toward the border and safety in Egypt. March 10, 2011  Defense and foreign ministers take up the subject of what to do about Libya in separate meetings in Brussels. 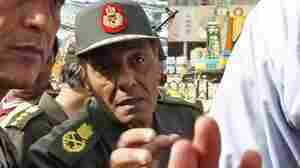 Top of the agenda was how the Western powers can help push Libyan strongman Moammar Gadhafi from power. But there was little concrete action taken on key issues — including whether to create a "no fly" zone over Libya. March 10, 2011  NATO Defense ministers, including Secretary Robert Gates, are meeting in Brussels to discuss the situation in Libya. Britain and France are pushing for a "No-Fly Zone," while the U.S. and some other NATO allies are much more cautious. March 3, 2011  In Germany, a lone gunman is accused of walking up to a U.S. military bus outside a main terminal at Frankfurt airport Wednesday and fatally shooting two American airmen. Two others were seriously wounded.